Last week, Dr Andermahr and Dr Allwork gave papers to the University of Zaragoza ‘Acts of Remembrance’ conference, organised by Constanza del Rio Alvaro and Maite Escudero Alias. In a panel dedicated to ‘Agency, Trauma and Memory in British Women Writers’, on Wednesday 24th April, Dr Andermahr addressed the audience with her paper on trauma in Jeanette Winterson’s ‘Why Be Happy When You Could Be Normal?’ while fellow Winterson scholar Susana Onega (University of Zaragoza) spoke on ‘Class, Trauma, Shame and Spectrality in Sarah Waters’ The Little Stranger. Speaking to the conference on the same day in a panel on ‘Holocaust Memories’ with Christoph Houswitscka (Bamberg University, Germany) and Rudolf Freiberg (Friedrich-Alexander-Universität Erlangen-Nürnberg, Germany), Dr Allwork talked about trauma and researching and writing the histories and memories of the Holocaust. Both Andermahr and Allwork’s papers were well received, reinforcing our academic partnership with the University of Zaragoza’s Research Group in Contemporary Narratives in English and raising the international profile of the University of Northampton. The hospitality of our hosts and our intellectual colleagues at the University of Zaragoza was second to none and it was wonderful to watch the presentation by Silvia Pellicer-Ortin on the construction of Jewish memory in Linda Grant’s works. Indeed, the conference coincided with the release of Andermahr and Pellicer-Ortin’s new anthology, Trauma Narratives and Herstory (Palgrave; 2013), a collection of essays based on the conference proceedings from a University of Northampton event which was primarily dedicated to the work of Eva Figes (12th-13th November 2010). The conference also provided an opportunity for Andermahr and Pellicer-Ortin to hold a series of meetings discussing a proposed EU-Marie Curie Project on post-1945 British-Jewish female writers which would see Pellicer-Ortin study as a post-doctoral student at the University of Northampton for two years. Testifying to the vibrancy of Northampton/Zaragoza research collaboration, it was also great to catch up with Professor Dolores Herrero (University of Zaragoza), a scholar of postcolonialism, a specialist on the literature of Merlinda Bobis and a member of Professor Janet Wilson’s proposed Leverhulme Postcolonial Film Network. 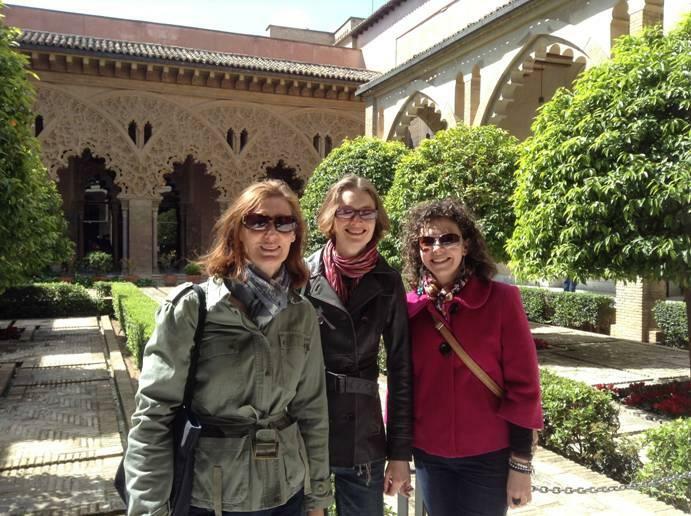 Moreover, one of Professor Herrero’s students at Zaragoza, Maria Pilar Royo Grasa is currently an exchange student at the University of Northampton School of the Arts. Other highlights of our trip included: the excellent keynote lectures by Professor David Lloyd (University of Southern California, USA), Professor David Eng (University of Pennsylvania, USA) and Professor Martin Elsky (City University of New York, USA); our visits to the Aljaferia Palace and the Goya Museum, which were accompanied by our hosts, as well as the Gala dinner which showcased the very best in Spanish cuisine and conversation. Posted on May 9, 2013, in Conferences, Events, School of the Arts and tagged conference, School of the Arts. Bookmark the permalink. 1 Comment.